When you are visiting Israel, you may want to experience the Druze villages of Daliat-El-Carmel and Usifiya which are about 10km outside of Haifa, past the Haifa University. If you are a resident you may want to program your GPS and head-out for regular visits and shopping. A street market with typical middle-eastern wares, curios and bric-a-brac. Middle-eastern cakes and confections like baklawa are also for sale. You will find a fair selection of restaurants selling hummous and typical middle-eastern foods. Even though you did not order them, there is a good chance that you'll be presented with a variety of complimentary salads while you are waiting for your food. The Druze are well known for their hospitality. Try a fresh Druze pita. The Druze pita is paper thin and about the size of a pizza. For about 10 shekels you can buy one. Request that it be served with labane (soured goat's milk cheese), olive oil and zaatar. Really delicious! The Druze Villages are a popular destination for tourists and during the week there are plenty of tour groups and buses. Prices for tourists are adjusted accordingly. Bargain!! 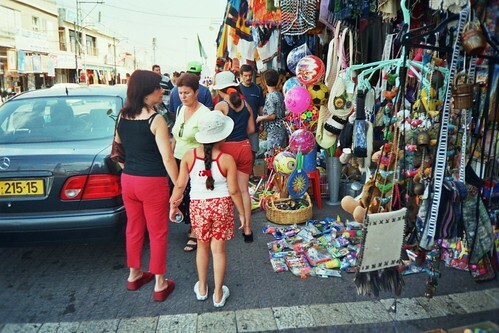 Saturday is a very popular shopping day amongst Israelis, so be prepared for hoards of people. Eateries are pretty packed at lunch-time so be ready to wait. Parking is not easy to find. You may have to park in one of the side streets and walk a little way to the main shopping area. If you are coming in from out of town and have the time and patience, you might want to park your car and take the 37A bus from the old central bus station (Egged), downtown, near the Rambam hospital. The bus travels through the Germany Colony where you can catch a glimpse of the Bahai Temple, up into the Hadar shopping district, passing the Bnei Zion Hospital, into the scenic Central Carmel, through the Ahuzza neighborhood. Finally it passes Haifa University, The Carmel Forest and then, after more than an hour, it finally reaches the Druze villages.